KDH Diabetes Education and Support Program is pleased to present Dr. Carla Eamon as a guest speaker on the subject of “Diabetes and Eyes” on June 28, 2018 at 7 pm in the hospital’s Courtyard Lounge. Dr. Eamon’s presentation will describe diabetic damage in the eye, the potential complications of diabetes on the eyes and vision, and how to try to avoid them. Dr. Eamon will also discuss general ageing in the eye. Dr. Eamon has been providing eye care in North Grenville for 30 years. 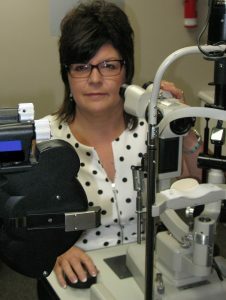 Having received her Bachelor of Science from the University of Guelph, she obtained her Doctor of Optometry from the University of Waterloo, as well as her Therapeutic Pharmaceutical Agent Accreditation. She continues to attend education sessions to keep up with the latest information on eye care. This special event is open to the public. Clients of the KDH Diabetes Education and Support Program have received a personal invitation; their family and friends are encouraged to attend as well, along with anyone who has an interest in the topic. If you plan on attending, please advise KDH’s Diabetes Nurse Educator, Carly Lang, at 613-258-6133 x212 or clang@kdh.on.ca. KDH’s Courtyard Lounge is located on the ground floor of the hospital to the right of the main entrance.